UU Church of Farmington members practice a diverse spectrum of beliefs. Our membership has included Humanists, Liberal Christians; Practicing Buddhists, Neo-Pagans, Agnostics, Atheists; and people who practice cultural Hindu and Jewish rituals. Unitarian Universalism is woven from a variety of world religions over 500 years. The foundation of our faith is based on compassion based activism, intellectual questioning and spiritual practices. This “We Are Unitarian Universalists” video is a tool for Unitarian Universalists to help show who we are, what we do, and why it matters. Watch it to learn about our faith and how we practice it. Looking for a Historic Wedding Venue or Wedding Chapel and Reception Hall in Farmington Hills Michigan? 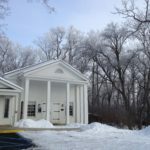 Our wedding chapel is an 1853 registered historic meeting house that is situated on seven acres of woods and gardens in Oakland County Michigan. A reception hall is available directly below the wedding chapel. Our wedding chapel and reception hall are conveniently located near hotels and major expressways. Click here for more information about our Historic Wedding Chapel and reception hall. Our Sunday School welcomes children and youth into an environment that leads them through a curriculum drawing on wisdom of world religions using our 7 UU Principles as the underlying foundation. We also have supervised nursery for babies and toddlers to play during the service.